The Motorola leaks continue to pour in today after seeing their new DROID lineup leak for the first time over the holiday weekend. 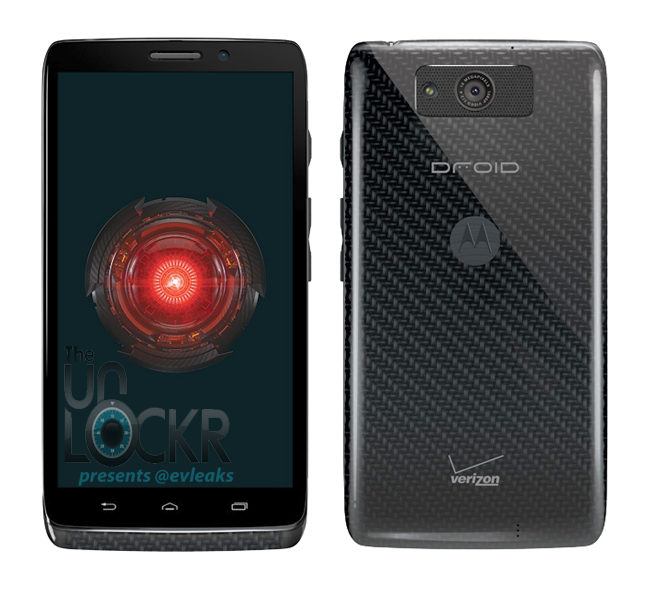 This time, we’ve got the front and back press render of the DROID ULTRA, once again courtesy of @evleaks. We had previously seen the ULTRA in white, but earlier reports indicated that the phone would also come in red, black (pictured above), and as a MAXX variant, with what we would assume to be a bigger battery. In this new render, we are getting the first look at the kevlar wrapped back, camera, and branding. The first thing that stands out is the subtle Motorola logo, along with the words “DROID” and “Verizon.” It doesn’t actually say “Motorola” or “4G LTE” anywhere, though it’s guaranteed to work on Big Red’s LTE network. The camera housing shows a top-centered lens with flash set to the left. The camera may also be surrounded by a speaker, however, it’s tough to tell from this photo. The camera may end up as a 10MP shooter with an extra “C” sensor that should help “establish white balance and exposure” to create better photos no matter what your environment is, at least according to @evleaks. He also guesses that the phone will sport a 5″ 1080p display and run a Snapdragon 800 processor with 2GB of RAM. On the front, we get a third confirmation that these new DROID phones (not the Moto X) will use hardware capacitive navigation buttons rather than on-screen keys. I have to admit that it seems a bit odd that Verizon is going to release an entire new DROID line of phones made by Motorola (DROID ULTRA, MAXX, and Mini), but also bring us the Moto X sans DROID branding. Why does Verizon need four Motorola phones in its lineup at the same time?